Boulder County breweries took home 2 of 3 medals awarded to this year’s Pro-Am competition at the Great American Beer Festival this past weekend. Lafayette’s Odd13 Brewing took home the silver, and Boulder’s FATE Brewing Company took home the bronze in the competition, beating out the other 93 entrants. The GABF Pro-Am competition pairs established professional brewers with amateur homebrewers to create a unique beer to present to judges, as well as to offer as samples to patrons at the festival. This year’s gold in the Pro-Am category went to Great South Bay Brewery (NY) for their collaboration with homebrewer Brian Giebel for their beer, “Muscat Love,” which is a Belgian Tripel made with Muscat grapes. Silver went to Odd13 Brewing’s collaboration with Mike Froehlich, for their “Atahsaisa,” which is an American Barleywine aged in an American oak whiskey barrel. FATE Brewing walked away with the bronze for their “Citra IPA,” which is an American IPA. We spoke to Odd13 Brewing co-founder Ryan Scott, as well as FATE Brewing’s owner Mike Lawinski and head brewer Jeff Griffith about their wins. Here’s what they had to say. Q: What are your thoughts on GABF this year? A good day for Lafayette? A good day for Odd13? Scott: GABF was a good day for Odd13 and a great day for Lafayette with LMX (Liquid Mechanics) taking home a bronze medal as well for their Alt. The Pro-Am is a really cool competition to have medaled in. The field was pretty big, you’re competing against so many different styles of beer, and it’s awesome to be a part of something that gives back to homebrewers. I was a homebrewer before I opened Odd13 and the idea of winning a Pro-Am seemed really cool at the time. I can only imagine that all of the people in the competition feel the same way. Q: Is this the first time you worked with Mike Froehlich? What do you think about the beer? Scott: This is the first time we’ve worked with Mike Froehlich, but he lives nearby and he and his wife Keelie are in our place quite a bit. The beer was his barleywine, and it was a fun beer to make because it’s a style that’s totally outside our wheelhouse. The day we brewed that beer, the mash tun was as full as I’ve ever seen it. Q: Is this beer going to be available at Odd13 taproom or was this created just for the competition? Scott: The beer will be available starting this weekend at the brewery. Q: Congrats on all of your recent recognition – you’re really making a name for yourself and Odd13 because of your mixed fermentations and out-of-the-ordinary creations. How does it feel to be recognized? Scott: The recognition we’ve received recently has been really gratifying. We’re doing some creative things and it’s nice to know that people are paying attention and appreciating what we are doing. Q: At GABF – were you able to hear any feedback from your competition like Russian River or Prairie Artisan Ales? I’m curious what other brewers in the same realm say about you guys. Scott: First off, Russian River and Prairie Artisan are inspiration to us, not competition. We had a bunch of great feedback from other brewers, some of whom are doing the same types of experimentation that we are. Recognition from other brewers is some of the best kind praise you can get. Q: Your booth – was awesome – off the record I feel you are going to be recognized by us for the Spirit Award (Stay tuned for EDB’s GABF Spirit Awards coming soon)! So congrats! 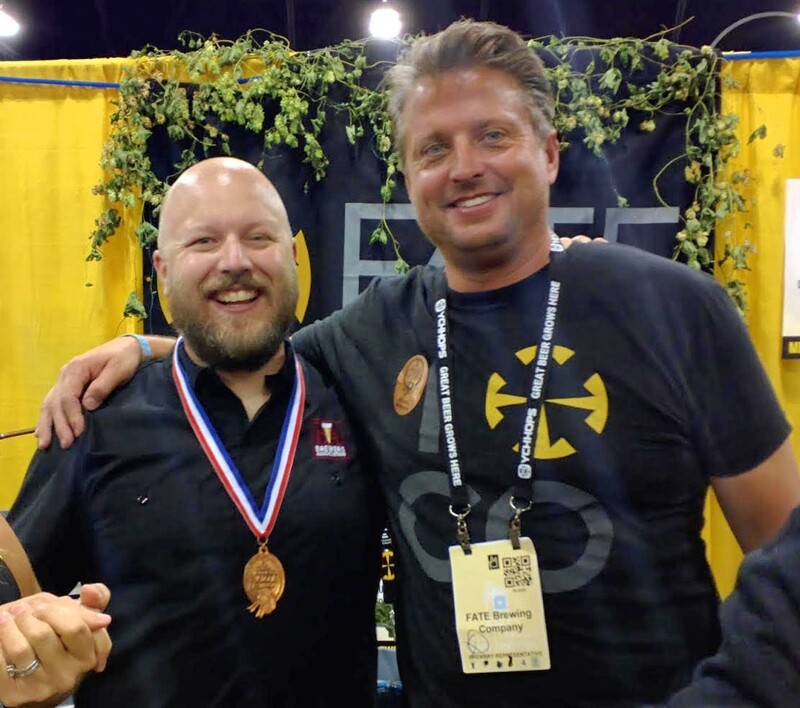 Homebrewer Ryan Lotter (left) with FATE Brewing Company Head Brewer Jeff Griffith took bronze in this year’s GABF Pro-Am competition. Photo by FATE Brewing Co.
Q: What was the Pro-Am competition like this year? Did you guys expect to win? Lawinski: The Pro-Am Competition was a large category this year with 91 entries. This category is really unique in that it is a “best of show” competition. This means that beers submitted to the category do not have to be a specific style, unlike the other categories at the Festival. The styles vary on a large scale, which makes us even more grateful to take home a medal in this competitive category. We submitted Pro-Am entries in 2013 and 2014, as this category is a really exciting one to be part of. It’s also an amazing showcase for homebrewers and allows these talented men and woman to share their passion and creation alongside brewers sharing in the movement of the craft beer industry. We never have an expectation to win. As a team, we all know that Jeff Griffith (JG) will continue to put out high quality, unique and tasty beer and we are always hopeful that he will be recognized for those talents and efforts. We feel so lucky to have the opportunity to be where we are, and to be part of the amazing platform that GABF creates to recognize great beer and craft brewers. Q: Tell me about Ryan Lotter – is this the first time You (Jeff) worked with him? Griffith: I’ve known Ryan for a few years through his local home brew club, Hop Barley and the Alers. We have never worked together until now. Ryan is a young, passionate and extremely knowledgeable homebrewer. I had the opportunity to try his beer at the Dredhop event earlier this year, and I loved it! His recipe, scaled commercially, turned out to produce an incredible beer and we look forward to FATE guests having the opportunity to try it in-house soon. Q: Can we expect to find Citra IPA on tap at Fate for a while? Yes! You can expect to see it on tap in the next week. We hope to see you at FATE soon to try this medal winning beer! Q: What are your thoughts about GABF this year? A good day for beer in Colorado or can we do better? Lawinski: In my opinion, GABF reached a new level this year and exceeded expectations on all fronts. The event has always been great, but the Brewers Association really executed an incredible experience this year for all parties involved. The addition of 90,000 square feet created less crowding, shorter lines and allowed for more time to engage with guests booth-side, and really talk about the beer and who we are. Another highlight this year was the addition of “Meet the Brewer” hall. There was an overall feel of camaraderie in the hall, and you could see the excitement on the faces of those who had the opportunity to meet the brewers. This was such a nice touch and added value for ticket holders that are truly passionate about beer. Overall, it was an outstanding day for beer in Colorado. We are thrilled to be one of the Colorado beer producers taking home a medal again this year. 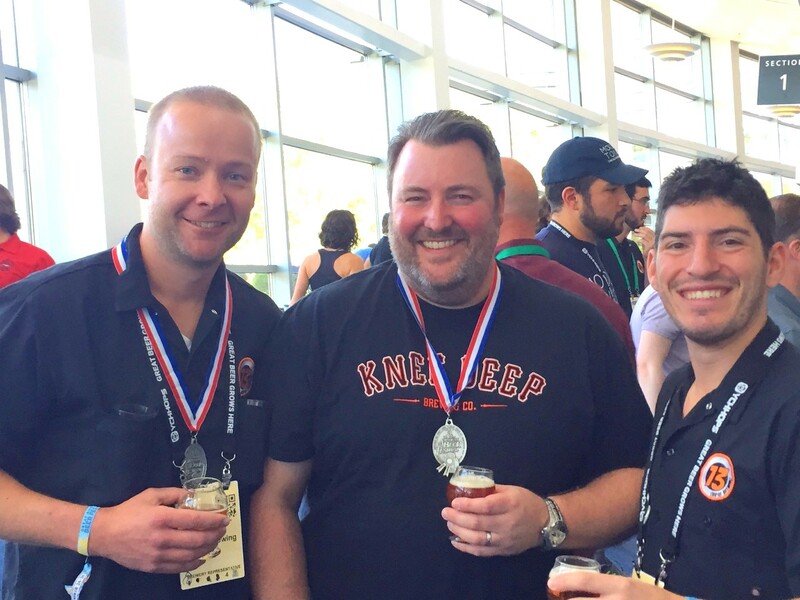 Next Next post: EDB Spirit Awards of GABF 2015 – Now with BEER GEEKS!